Go to Forms => Settings => Sendy Add-on. You will need Sendy App Url, Sendy Api Key and Plugin License Key to get started. -Plugin License Key: You will get Plugin License Key in email after you purchase Gravity forms Sendy Addon. -Sendy Url: Complete Url where you have installed Sendy App. -Sendy Api key: Your Sendy API Key, which you can see in your Sendy App dashboard. Go to Forms and edit one of your Forms. On the tab click on Settings => Sendy Add-on. -Feed Name: Give your Feed any name you would like. -List ID: Enter the List ID to which you want to add contact in Sendy. 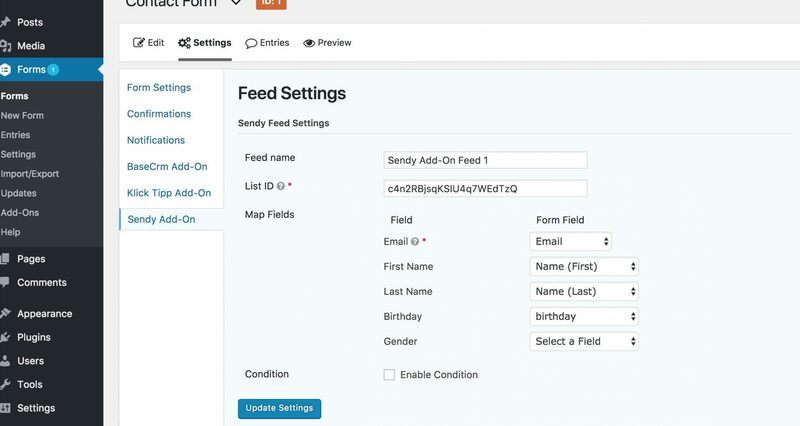 -Map the Sendy Fields with Forms fields. That’s it .. Now when you submit the form it will add new contact in your Sendy List.